Burlington, NJ January 30, 2018 — Infraspection Institute’s IR/INFO Conference was recently held in New Orleans, LA. IR/INFO 2018 marks the 29th anniversary for the advanced training conference, technical symposium and technology expo. 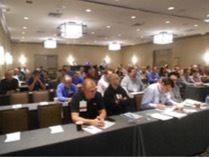 IR/INFO was attended by infrared thermographers, PdM technologists, and building inspection professionals from around the world who enjoyed four days of networking, learning, and fun in a relaxed and professional atmosphere. 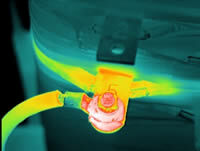 Co-sponsored by United Infrared and Temperatures.com, this year’s conference also featured the latest in infrared imagers and software from several manufacturers. Sunday evening’s Welcome Reception and Mardi Gras party featured plenty of local fare. After dinner, Skip Handlin provided a local perspective on the significance of Mardi Gras and helped to make certain that all guests left with some much-coveted choice beads. Another highlight of the conference occurred on Tuesday evening when guests were treated to a cocktail reception sponsored by the IRINFO Group. Several door prizes were provided including thermal imagers donated by FLIR Systems, Inc., Diamond Technical Surveys, and Fotric Precision Instruments. Following the reception several attendees strolled to the French Quarter to enjoy local cuisine at the city’s famed restaurants. Attendees visited well known attractions including Preservation Hall, Jackson Square, Café Du Monde, and several of the nightclubs along Bourbon Street. Copies of the proceedings from IR/INFO 2018 are available on USB flash drive by calling Infraspection Institute at 609-239-4788 or by visiting the Infraspection Online Store. Proceedings include PDF copies of papers presented and PowerPoint slides from all Short Courses.